Today is Monday, December 12, the 347th day of 2016, with 19 days remaining. There are nine days until the winter solstice, 11 days until Festivus, 12 days until the start of Hanukkah, 13 days until Christmas Day, 39 days until Donald Trump becomes president of the United States, and 694 days until the November, 2018 mid-term election. 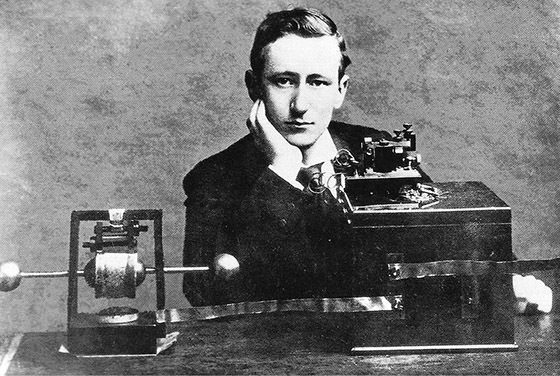 On this day in 1901, at a site set up in St. John’s, Newfoundland, Guglielmo Marconi revolutionized international communications when he heard three little clicks- the letter "S" in Morse code- sent by his colleagues from a transmitter in Cornwall, England. At Signal Hill, Marconi and his assistant George Kemp held a telephone receiver and a wire antenna in the air with a kite. On Dec. 10, the Poldhu sent a message, but Marconi could not receive it. Two days later, using the fourth kite of the experiment, Marconi and Kemp at last heard a signal, transmitted from Poldhu, 1,700 miles away. Among other things, today is the Festival of Unmentionable Thoughts. Please keep them to yourself. Today's 'Florida Man' is a half-naked drunk woman. She seems nice. As of this writing, The KGB Quotations Database contains 42,826 entries. Check it out. Lillian Smith, writer and social critic of the Southern United States. Quote of the day: "I'm not unmindful of a man's seeming need for faith; I'm for anything that gets you through the night, be it prayer, tranquilizers, or a bottle of Jack Daniel's. But to me religion is a deeply personal thing in which man and God go it alone together, without the witch doctor in the middle." Scientists turn nuclear waste into diamond batteries that'll last for thousands of years. Of course, there are a few bugs to work out. If you love dogs, get a shelter mutt. Veterinarians urge dog owners to stop buying pugs, bulldogs, and other breeds with "cute" genetic defects that can make their lives a living hell. The ancient Greeks were apparently even further ahead in their astronomical understanding and mechanical know-how than we'd imagined. The "Antikythera mechanism," a sophisticated mechanical device whose remains were found in a shipwreck off the coast of Greece in 1900, has been analyzed and duplicated. By 2009, modern imaging technology had identified all 30 of the Antikythera mechanism's gears, and a virtual model of it was released. There's even a Lego version. If I were about 20 years younger and had no family, this would be my dream job: Wanted: One journalist to write, edit, lay out, and deliver a newspaper. About that Trump election "landslide." Not even close. 46th out of 58 in electoral college terms, and 56th out of 58 in the popular vote. Robots are already replacing humans at fast-food restaurants and other venues. As Jay Leno said, "These are the robots not smart enough to work at NASA."